Meet your group and Tour Manager at the Novotel Peace Hotel in Bejing, the rest of your day is free to begin your investigations of this captivating city. Today we discover the sights and sounds of China's vibrant capital. This morning, we visit the infamous Tiananmen Square, which, at over 4 million square feet, is the largest city square in the world. Stretched out across this space are several vivid reminders of China's political history, including an imposing portrait of Chairman Mao. We also take in the neighbouring Forbidden City, which is now a UNESCO World Heritage site. Boasting almost 1,000 buildings, this magnificently restored complex - with its historic pagodas and traditional Chinese palace buildings - makes a dynamic contrast with the contemporary square. our final visit of the day is to the breathtaking Summer Palace. We begin our day with a visit to the Temple of Heaven, a beautiful edifice in central Beijing. After some time here we visit the world-famous Great Wall of China. 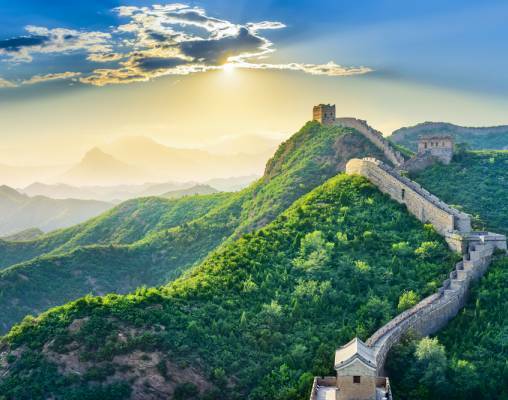 Listed as one of the modern Seven Wonders of the World, this masterpiece of Chinese workmanship stretches thousands of miles from the Gobi Desert to the Korean border - and is truly an awesome sight to behold. We visit the Mutianyu section, a beautifully preserved stretch which offers incredible views over the seemingly endless mountain scenery. After ascending by chair lift, we have the opportunity to walk along the wall before returning to Beijing. Here we see the 'Water Cube' and the 'Bird's Nest', the main arenas used in the 2008 Olympic Games. Tonight we enjoy a traditional Peking duck dinner together. Leaving Beijing behind, we join the rail service to Xi'an. Our journey on the high-speed service takes us through the beautiful landscapes of rural China. In Xi'an we transfer to our hotel, the Grand Mercure Remnin Square, for two nights. On Day 5 we discover the famous Terracotta Warriors - one of the world's greatest archaeological finds. The 6,000 figures - some with horses or chariots, but all with unique features - were buried in 210 BC, yet only discovered 40 years ago. 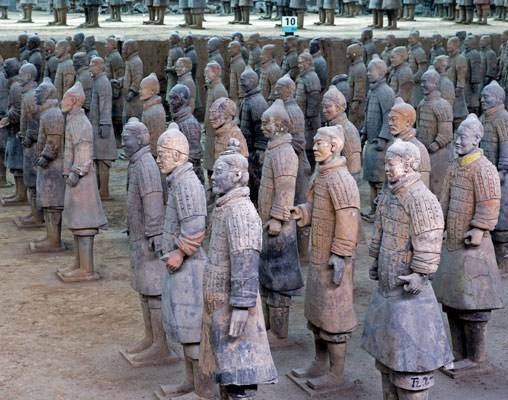 The life-sized statues were built as part of an elaborate tomb of the Qin Emperor, believed to protect him in death just as his real army had in life. Built on an incredible scale, the soldiers - all grouped in rank order - are a breathtaking sight. Later we discover more of the walled city of Xi'an, taking in the Great Mosque, the city's lively bazaar and the Small Wild Goose Pagoda. Dating back to the 8th century, the towering structure is a leading example of Tang Dynasty architecture. Today, we travel on the new high-speed rail service from Xi'an to Chengdu, where we spend two nights at the Tibet Hotel. On Day 7 we travel into rural China to Leshan, and visit the ancient Giant Buddha Statue. Carved into a towering mountain range, it is the world's largest stone statue at 233ft tall. We have time to admire this immense structure before returning to Chengdu. Here we see the Wenshu Monastery, one of China's finest Buddhist structures, as well as the historic teak buildings on Jinli Street. Today we visit the Giant Panda Breeding Research Institute, which is spread out over 200 acres and is now home to more than 100 of these magnificent creatures. The project allows us to see the Giant Panda, an enchanting and rare creature, at close quarters in a near-natural habitat setting. Later we transfer to the station for the high-speed bullet train service to Chongqing, situated in the upper reaches of the Yangtze River. 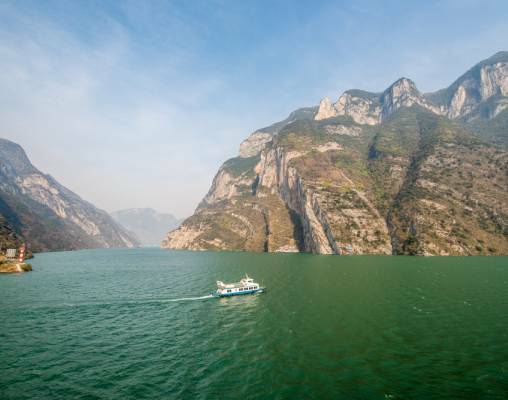 Here we board the luxury 5-Star Century river ship for our three night cruise along the Yangtze River, through the dramatic scenery of the Three Gorges. This morning there is an optional excursion to Fengdu Ghost City. This afternoon we visit the stunning Shibaozhai Pagoda, rising 12 stories up a sheer cliff face. Our cruise continues on Day 10 with a shore excursion to Shennong Stream, a stunning natural beauty where the cliff sides soar steeply away from the nearly emerald waters of this beautiful stream. This evening, enjoy the Captain's Banquet on board. We disembark at Yichang today, before we visit the colossal Three Gorges Dam, which is now the world's largest hydro power project. After, we travel by highspeed train to Wuhan, for a night at the Marco Polo Hotel. On Day 12 we visit Wuhan's distinctive Yellow Crane Tower, a stunning example of traditional Chinese architecture and the subject of many local legends, before transferring to the railroad station for our eastward journey to Shanghai. We spend two nights at the Pullman Jing'an Hotel. Today, we begin our explorations of Shanghai. 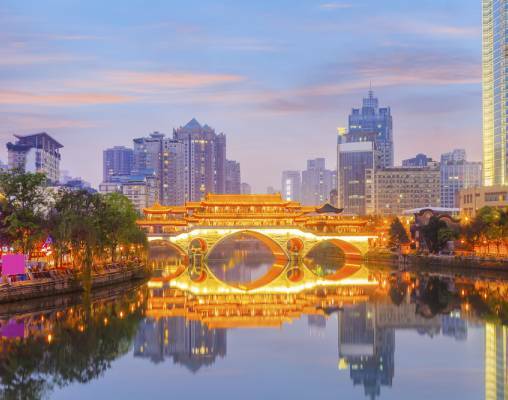 We see the Yu Garden in Shanghai's historic core, where we enjoy a traditional tea ceremony, as well as the bazaar and the Jade Buddha Temple, ahead of visiting the beautiful French Concession and the Bund in the afternoon. This evening, we enjoy a farewell dinner at Xianqiangfang Restaurant, a restaurant renowned for its traditional cuisine. On Day 14, your tour concludes. Ideally situated in the heart of Beijing, the 4-Star Novotel Peace Hotel is a short metro ride away from Tiananmen Square and the Forbidden City. Its facilities include a lobby bar serving alcoholic and non-alcoholic beverages as well as a selection of hot and cold snacks. There are two restaurants serving international and French cuisine, as well as an indoor swimming pool, sauna and fitness center. Massage therapies are available (payable locally). The air-conditioned rooms feature facilities such as a telephone, television, hairdryer and complimentary Wi-Fi. A dry cleaning and ironing service is available at this hotel (payable locally). Set within the ancient walls of Xian, the 4-Star Superior Grand Mercure Renmin Square, Xian combines chic Chinese design with modern touches. Among the hotel's many facilities is a restaurant serving both Chinese and western cuisine, a bar and lounge, a fitness center and a wellness center offering massages. The rooms are air conditioned and come with a television, telephone, minibar, safe, Wi-Fi and tea & coffee making facilities. A laundry service is available at the hotel. The 4-Star Tibet Hotel Chengdu is conveniently situated five minutes from the nearest railroad station. The hotel was built in 1988 and boasts more than 25 years of history, accommodating guests with 276 well designed and comfortable rooms this hotel has plenty to offer, attractive on the outside as it is within. The hotel has two restaurants, laundry facilities, sauna, fitness room and a beauty salon amongst other excellent facilities on offer. The grand 5-Star Marco Polo Hotel enjoys a superb location in Wuhan, overlooking the Yangtze River. It has an indoor pool, jacuzzi, fitness center and a choice of restaurants offering a variety of cuisine. The rooms come equipped with facilities including internet access, a television, telephone, safe and tea & coffee making facilities. The Pullman Shanghai Jing'an (Formerly Grand Mercure Shanghai Central) is ideally situated in the heart of Shanghai, just minutes away from some of the city's attractions. The rest are all in easy reach from Shanghai's efficient Metro system, only a two minute walk away. The hotel boasts an impressive variety of both local, greater Chinese and international cuisine from its three restaurants, as well as a host of refreshing beverages from the bar. There is also a fitness and wellness center, including a gym and sauna, and massages are available. All well-appointed rooms are en-suite and are equipped with air conditioning, desk, satellite television, telephone, safe and tea and coffee-making facilities. The hotel offers a laundry/dry cleaning service. 26th April 2019 $3,325 Please call for availability. Enter your details below if you would like to be notified when 2020 dates and prices are available for Grand Tour of China. Prices are correct at the time of publication, however are subject to change at time of booking. Hotel and Rail accommodations listed above, are subject to change based on availability at the time of booking. Prices are per person, based on double occupancy.